This shorter Topshop trench is on sale for $75. Love the back draping on this Cupcakes & Cashmere option! Adore the blush tint to this sweet Club Monaco trench. Here’s another Cupcakes & Cashmere style that’s nearly identical to mine, but sans belt! Go the sleeveless route with this style. If you’re headed to a particularly wet climate, try this water-repellant style from THE ROW (on final sale)! 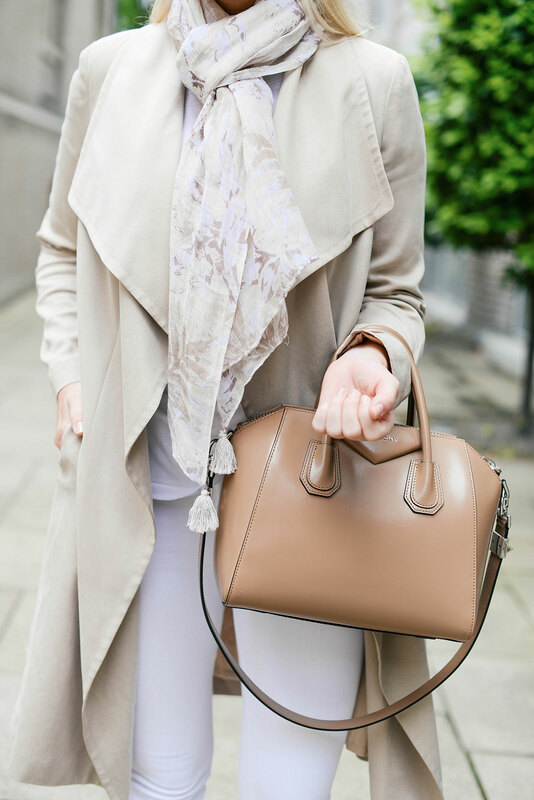 Love this neutral look, that bag is a beauty. Love this outfit! The layers and neutral tones are styled so well! Ooh I’m going to Seattle next week and had no idea it was still cold! Need to re-think some wardrobe options, ha! Loving these neutral layers on you – so chic! Can’t wait to see more pics from your trip; the snaps were so fun! You always look so good in neutrals, that scarf is beautiful! Can’t wait to see more from Alaska. Such a great street style look, love a good trench coat! A classic trench is the perfect investment piece! I love a simple neutral look. Always flattering and chic!